Agents for Tsudakoma Corporation, Japan. The ZAX9200i is an advanced air jet loom that is worthy of the name ‘MASTER’. 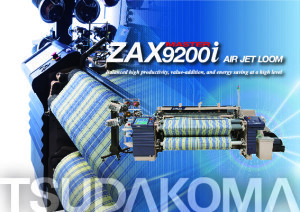 It upgrades the high speed ability of Tsudakoma’s best- selling air jet loom the ‘ ZAX9100 Professional’. The ZAX 9200i saves resources, energy and manpower. Newly upgraded electric components strongly support the ZAX9200i MASTER. T-Tech Japan Corp was founded in May, 2008, inheriting the state-of-the-art technology for preparatory machines from Tsudakoma Crop and Toyota Industries Corporation. T-Tech Japan’s products are top level performers and are ready for the dynamic market demands in preparatory machines.